To watch the video on Youtube please click on the link here. Most of the Alfred Hitchcock hour episodes are not really directed by Hitchcock, but for the simlar style I’m putting them under the same category. 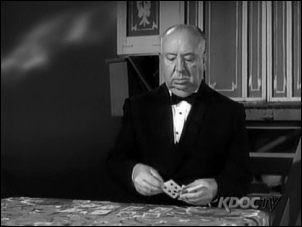 The Alfred Hitchcock Hour TV episode “House Guest” is based on the novel The Golden Deed (1960) by Andrew Garve. I am not sure whether the original story is more convincing and well-paced than the TV episode, but here I am trying to see what a one-hour drama has to offer in terms of thoughts on human nature, regardless the technical quality filmology-wise. Is it true what Hitchcock said at the end of the episode, that the moral of the story is to teach us to “think it over” when a stranger offers to save your life? What if you were drowning in water like the little boy did? I believe in cautious living but not overthinking. There are moments when we have to rely on our intuitions in taking a decision, or just follow our body because there is no time to even feel. What goes wrong in the film is the parents’ sticking to the idea that “this man saved the life of our son so we need to pay him back”. In truth the life of a boy is priceless, and exactly for this reason any gratitude in the material form is a bend of the principle. When the father starts to offer financial help to the benefactor in measure of dollars, it just smells wrong. A stranger becomes a house guest after he saves the life of the little boy. The “accident” does not change the fact that he remains a stranger – how much do you know him? How much do you share? How much do you trust him? Saving a life is an extraordinary event which should not make a stranger suddenly become a trustworthy person, a welcome guest, or a worthy friend to keep for the rest of your life. But the strong sense of gratitude makes us feel in this way. This is the trigger of this mystery. Another interesting thing about this story is the role of woman. As in the majority movies/TV episodes directed by Hitchcock, women display remarkable independence and intelligence. They seem to know very well what is truely important to them, and often appear wiser than their male counterpart in dangerous situations. In fact, I should say they are perfect complements to the men. In this story, the stranger-benefactor uses the common weaknesses of man and woman respectively in dealing with the couple – with him his reputation in the society, his desire in pursuing a meaningful career, his pride in keeping up with his words; with her flirtation and jealousy. I was happy to see our level-headed heroine does not move for these tricks of his, although we should not forget she is the one to invite him home and introduce him to her husband. The husband does eventually get into big trouble and become a “murderer”, almost. She reminded him many times to call the police, but he insists in dealing with it “his own way”, which turns out to be what sinks him. Towards the end we find out, this time again the woman turns out to be the wiser one, rescued by the man.